Practical Instruments, maker of Heliotube concentrating PV solar panels is the most recent solar supplier that I have come across. They have put 10 small solar troughs, that rotate to follow the sun, in a panel that is the same length and width as a traditional panel, 60" x 42" x 6", weighing 45 pounds and mounts like a traditional solar panel. CEO Brad Hines told The Energy Blog that they have a geometric concentration ratio of about 10:1 which, gives them an effective concentration ratio of about 8.5:1, after losses. They use A-300 SunPower solar cells with above 20% efficiency and passive cooling. They are working on a product for the future that will use triple-junction cells such as those from Spectrolab. Hines told me that they are using a single axis tracking system and that "Conventional wisdom is that the benefit of single-axis tracking over a fixed tilted system is about 20% annually, while the second axis of tracking adds another 10%. For most people, the additional 10% won't be worth the added cost of a second axis of tracking." Their tracking system in auto-aligning, with no alignment required and is self-powered by a single motor using electricity generated by the panel. The panel is rated at 177 Weq, 2.5 amps at 70 Volts typical. It is certified for grid connection and warranted for 20 years. The website states that with rebates HeliotubeTM costs significantly less than equivalent wholesale solar panels in terms of kWh/year per dollar. And with rebates, Heliotube even further reduces the consumer's payback period relative to traditional solar. In an interview with socalTECH.com Hines was quoted as saying: "The problem is that solar power costs too much. Experts say that when you can get down to an installed cost of 3 dollars per watt of power production, the market will take off. That's when solar power will equal the cost of other forms of electricity, at the retail level. We're going after the rooftop market, and believe we can hit the goal of 3 dollars a watt with the rebate in California, and stay below that even after rebates go away. It's cheaper than electricity you buy from the power company." Practical Instruments is currently developing their initial proof-of-concept prototype using funds provided by the company's founders and by private investors. In a CNet news.com article Hines was refereed to as saying "Practical Instruments is seeking to raise a round of venture capital." They plan on shipping early adopter units later this year, and ramping to volume in late 2006 and early 2007. This concentrator seems like a good idea. However, true breakthroughs in solar power will require independent and government analysts to design solar systems at the lowest possible cost. A good general rule for large-scale industrial machinery: it shouldn't cost more than 10 dollars per kilogram. A new microwave oven can be purchased for 50 dollars. 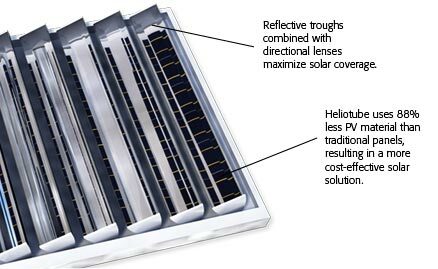 A 1-square-meter concentrator with integrated cells and heliostat could be made for 50 dollars: the mass and complexity of these is comparable. Why, when there are so many talented people eager to compete, do solar systems get to be luxury priced? Commodity pricing is the solution: if all costs cannot be explained and justified - to the penny - then the price is too high. Tony: An equivalent microwave was 10X or $500+, 25 years ago. Solar panels (like microwaves) may follow about the same price drop when mass production is transfered to China, India or other higher production efficiency countries or production is fully automated. A 10X price drop may take a few years but it will come as it did with Desktop PCs, LCD HDTVs, DVD players, Mirowave ovens and other similar gadgets. Reading between the lines, this costs above $3/watt before rebates, which makes it the most expensive solar concentrator technology yet, as reported here. I'm pretty sure the $3/W is the installed price, not the panel price. In order to hit $3/W installed, they're going to have to be under $1/W for the panels themselves, which is a lot cheaper than current panels or concentrators. Solar energy does not cost anything, the source that you choose cost some but in the long run it will be a good investment. I interested in selling alternative energy as a livelihood. I know most solar panels are made from petroleum which is a problem. Bio Solar panels have promise but someone at a dinner party mentioned Cera something panels. Does anyone know about this issue? Also, does anyone have a tip on what I call the "green Google"? A small start up alternative energy company, well run, visionary in its goals and on the upswing? Perfect, you want to earn a living selling that you know nothing about hopefully to the clueless. It sounds like you want to be an unethical con artist. You should have lots of company. This is a amazing this flat panal all the best. Quality of Flat Panel is very reasonable. I liked this discussion much, thanks for the great info. so we have to think about this more... and word is this.. for our life...how we can improve our life more? this is very useful discussion.. we will follow your post.. It takes effort and energy, after all, to fabricate the various parts of a solar module, like the solar cells, backsheets, frame and wires. Solar panels is a popular method to eliminate the energy drain by using natural energy. Cost cutting on monthly power bills, making money by selling excess power and getting tax rebate from government helps to cover the cost of solar energy systems. I give you credit for building this up. will require independent and government analysts to design solar systems at the lowest possible cost.